Lady's slippers (Cypripedium) are a type of orchid native to eastern North America, many of which are considered rare and endangered species. Growing lady's slippers is not for the faint of heart, as they have very exacting requirements, yet it remains a popular pursuit among orchid enthusiasts and conservation gardeners. The lady's slipper is not your ordinary wildflower. Lady's slipper orchids have a large pouch-shaped petal at the base of the flower (resembling the toe of a slipper) which is crowned by three elongated oval-shaped petals rising above it. Coloration varies, but is often quite exotic - white blushed with pink, green tinged with brown, and many striped and speckled variations featuring golden yellow, brick red, and purplish-black are available. Most lady slipper orchids come with just two strap-like leaves, but they can grow to enormous dimensions - up to a foot in length is not uncommon. The flowers rise on stalks a foot or two above the ground in late spring, often with just one flower per stalk. In nature, lady's slipper is found in moist deciduous woodlands where they are increasingly rare. The plant is so sought after that many gardeners go out and dig up a clump, reducing wild populations. It takes over a decade for a lady slipper to produce flowers from seed and germination rates are extremely low, meaning they are slow to replenish themselves in the wild. Many reputable nurseries have perfected the art of growing lady's slipper by seed, making them available to gardeners and preventing the removal of wild plants. Getting the seed to germinate reliably involves specialized lab equipment, so it's not really feasible for home gardeners, meaning you'll want to focus on creating the right conditions to keep the plants alive once you obtain them from a nursery - which is difficult enough! 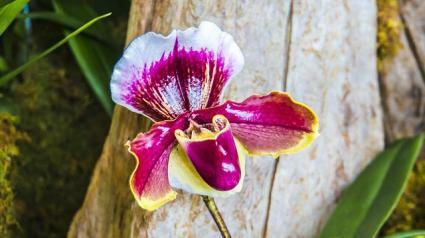 Orchids in general are more expensive than other plants. Since lady's slippers are are and difficult to grow, they will be more expensive than the typical indoor orchids you might buy at a nursery. Botany Boy recommends several different nurseries to purchase them from, including Arirang Orchids and Plant Delights Nursery, Inc.
Lady's slippers grow under mature deciduous trees in the wild and are most likely to succeed if they are planted in this environment in your garden. Shade is essential - not deep dark shade, but filtered, indirect light. Soil should be rich and fluffy with lots of organic matter. If it's not, blend in a thick layer of compost prior to planting. While you can grow them in pots, using an orchid mix type of potting soil, they aren't really suitable for indoors. This is because they need to go through a period of cold weather each year in order to bloom. These plants are typically purchased as a tuberous rhizome in fall or early spring, which should be planted immediately. The rhizome should be planted with its pointed tip facing up. The plants are naturally dormant through the winter and are one of the last species to emerge from the ground in spring. 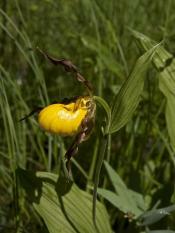 Make sure to check the growth of nearby plants so the lady's slipper has an open space to emerge into. Monitoring moisture levels is the primary care. They should be watered as soon as the top inch of soil becomes dry, but avoid watering so much that the soil becomes boggy. Maintaining a layer of mulch around the plants is critical to success, though it is best to use decaying tree leaves as mulch rather than things like woodchips. When the plant goes dormant for the winter, the leaves can be clipped to the ground. Lady's slipper orchids are not bothered by pests and disease, but they are hard to grow without providing soil conditions that replicate their natural environment. There are many native lady's slipper species to choose from. 'Pink lady's slipper' has a deep pink pouch with maroon petals. 'Formosa lady's slipper' is pinkish-white with stunning patterns of red markings on the petals. 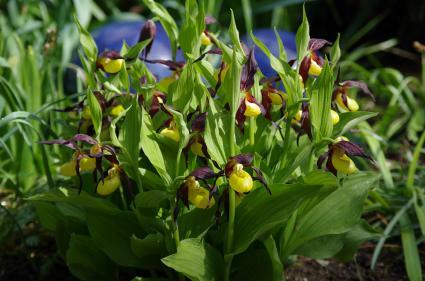 'Yellow lady's slipper' has a golden yellow pouch and maroon-brown petals. Lady's slippers are as dainty and elegant as their name implies. They are quite demanding, but the patience and effort required to grow them pales in comparison to the sight of a mature patch of the orchids in full bloom on a spring day.